The fifth edition of Fishing Central Oregon and Beyond has been updated and expanded by 64 pages and includes over 500 color photos, many new waters, detailed maps and instructional illustrations that complete the picture of Central Oregon’s renowned fisheries. 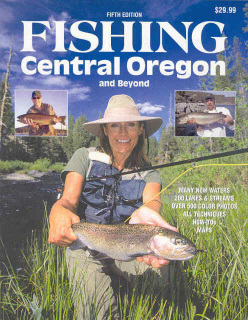 Bend outdoor writer Gary Lewis, is the contributing author in this fifth edition. Gary researched, fished and documented a host of new waters to include in this edition, some a little beyond what most consider Central Oregon. In addition to Gary's insights and expertise, this book includes regional contributions by Brooke Snavely and Raven Wing. The rivers, lakes, streams and ponds of Central Oregon, including the high Cascades, and beyond offer some of the best fishing in the country. Lewis describes it in detail giving you the information you need to fish successfully first time, every time. Widely respected author and outdoor writer Gary Lewis, of Bend Oregon, won 1st place in the Northwest Outdoor Writers Association (NOWA) Book of the Year awards for Freshwater Fishing Oregon & Washington. More than 100 color photos, 60 black and white photos, informative illustrations, and in-depth instruction for the adventurous Washington and Oregon fisherman. across much of the West. Born and raised in the Northwest, he has been walking river trails for as long as he can remember. He has won awards for his newspaper columns, and contributes to multiple regional and national outdoor publications.